Nope, this is not a Game of Thrones review, even though I wish it was. 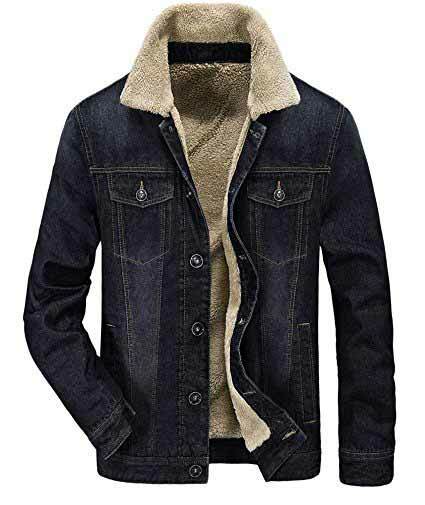 It is a review about the best Sherpa lined denim jacket you should buy in preparation for the coming winter months. If you are unfamiliar with Sherpa jackets, I won’t be surprised. They are not really featured in fashion websites or glossy magazines but for those who live in deep winter country, they are an essential staple to fight frigid days. For the sake of this article, let’s assume you are a novice who has no idea about what a Sherpa jacket looks like or what to look for when shopping for one. Hopefully, by the end of this piece, you should have enough idea to make a decision about the type of Sherpa jacket you want. For all of its good properties, making a jacket out of just Sherpa lining is a pretty bad idea. For one, Sherpa lining is neither waterproof nor windproof. And in cold freezing winter with all of its nastiness, a jacket that has neither qualities is a huge no-no. To counter this, the Sherpa lining is sewn into the interior of a much heavier fabric such as cotton. Here’s a tip, watch out for Sherpa jackets that either double-stitch or triple-stitch the lining, they are actually the best ones as they conveniently seal the lining and prevent the loss of warm air through the seams. There are some Sherpa jacket that also include quilted padding for added warmth. This padding is typically sewn between the lining and the heavy outer covering. But even though it gives the jacket a puffy, bulky, and heavy look, the warmth is undeniable. 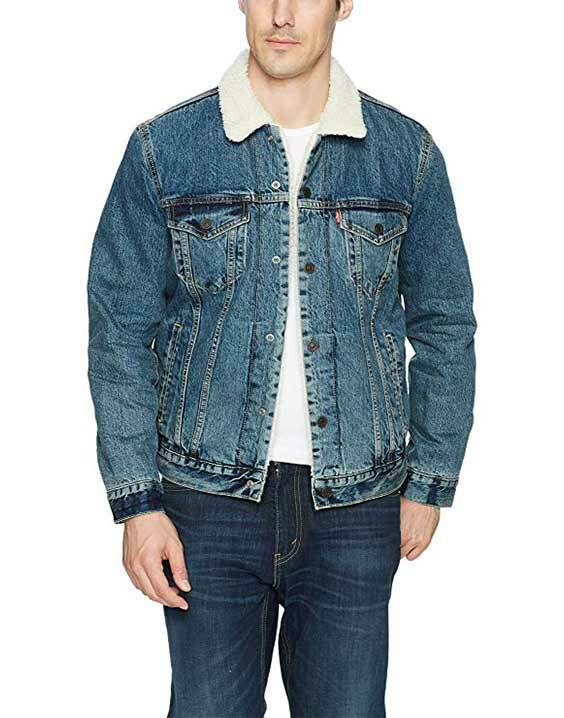 The basic Sherpa lined denim jacket is usually thigh length with slit hand pockets, flap chest pockets and full front zipper or button down closure. The interior and collars are also lined with Sherpa. For some jackets, the sleeves are also lined with Sherpa but for a vast majority, the sleeves are exempt. Brands vary the look of their Sherpa jackets by designing the pocket, collar and cuff in ways that sets them apart from others on the market. Now that your knowledge of Sherpa jackets have been broadened, here are 8 items you should totally consider in your winter ensemble. 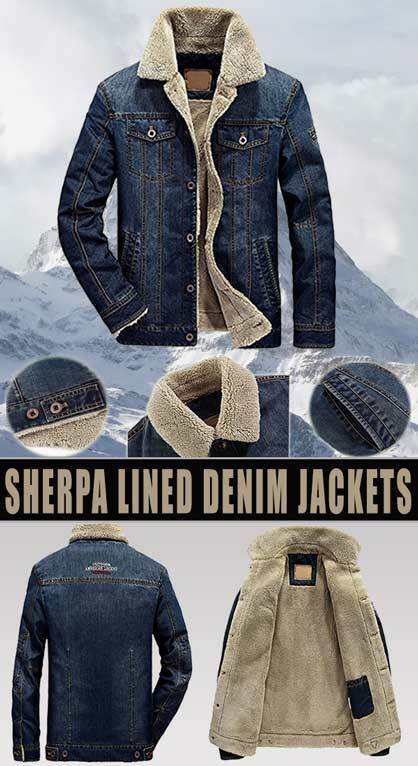 A truly stunning Sherpa lined denim jacket that mixes ruggedness with fashion? This might sound like pure baloney but as this jacket proves, dreams do come true. One word I can use to describe this Sherpa lined coat is beautiful. The stylish design is just breath-taking. Apart from being good to look at, this denim trucker jacket functions in the way that it is supposed to. The warmth it provides and the amazing fit is a reason why it is on our list of Sherpa lined men’s denim jacket. 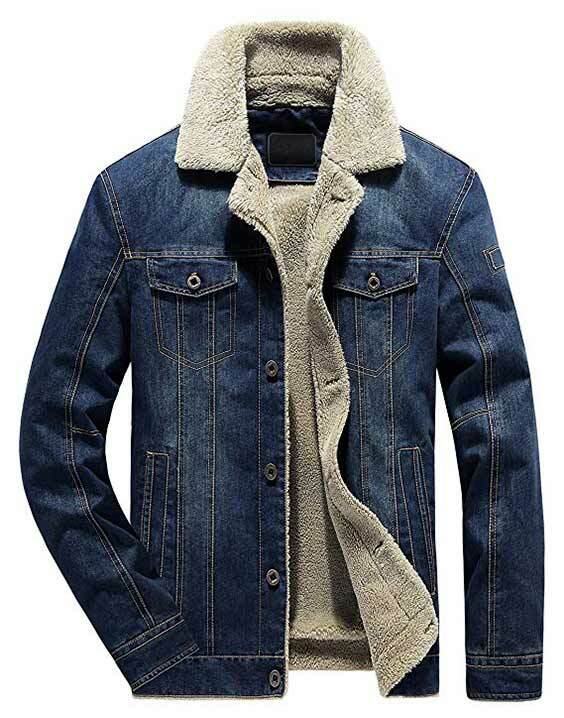 This sherpa blue jean jacket is made of high-quality light-washed and distressed cotton denim fabric and is available it two color, blue/dark blue. This fleece lined jeans jacket is the epitome of refined craftsmanship that every fashion conscious man would recognize. The superb design and attention to details makes it a winner at all times. This is one jacket that does not compromise with warmth as the body and sleeves are also lined with fleece, a rarity among Sherpa jacket. The outer denim layer is made of a high quality that will ensure it keeps it look for a long time. And the fit is just right, nice and snug. Just what the doctor recommended for cold days and nights. From the guys who gave us the iconic blue jeans comes this stylish Levi Sherpa jacket. Made with 100% cotton that is delicately lined with Sherpa , you can brave the bitterest of winter’s assaults without so much as a sniffle. This jacket is also stylish enough to be dressed up or down. How about the quality? This is a Levi’s ensemble, and that brand name is synonymous with the best quality clothing available in the market. If you are in the market for a slim fit Sherpa jacket, look no further than this beauty. It is stylish enough to be worn at virtually any occasion you can think of be it indoors, business, dates, party, and outdoor activities. Not just made solely for winter, you can rock this black denim jacket during cold months in fall or spring. It keeps the wind out and the warmth in with its single breasted button down closure. And of course, I won’t forget the two chest pockets that adds a touch of class while being functional at the same time. 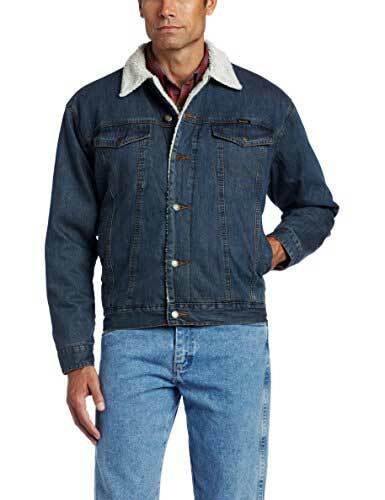 Wrangler is one of the leading brands in casual apparel and they have consistently delivered for about 70 years. So when they do issue a denim coat, it is definitely worth your time to consider it. This Wrangler Sherpa jacket mixed the casual laid back lifestyle of western culture with modern day fashion. 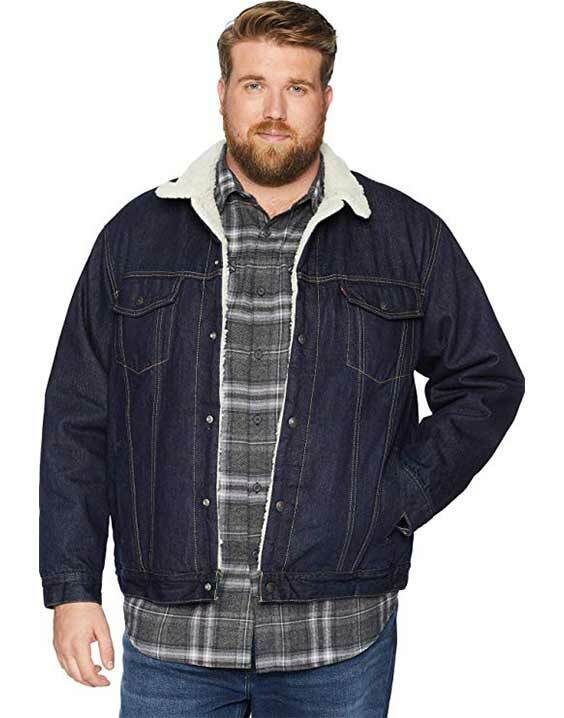 This Sherpa collar denim jacket also does a great job of keeping you insulated from your neck down. In addition, the fabric holds its own and you are assured that it will not stretch no matter how many washing cycles you put it through. 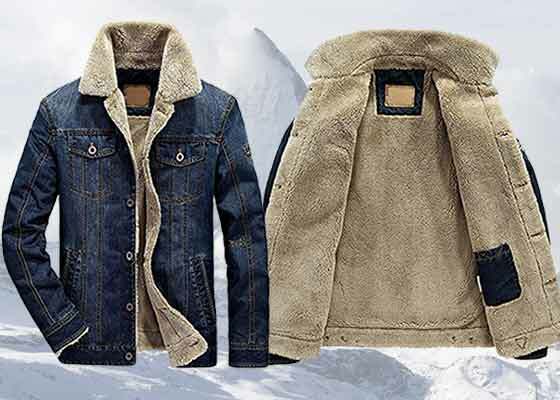 In your traditional western styling, this Wrangler sherpa lined denim jacket features a sherpa collar and stylish front pockets with stitching. The quality of the materials and manufacturing are the first rate. The fit is what you will expect for a big and tall guy. The cut of this Sherpa Trucker Jacket was designed to make you look really good button-up or open. Those days of macho men looking ludicrous in terrible clothes are long gone. With this amazing jacket outfit from Levi’s, you can be a hard hat and look fashionable at the same time. 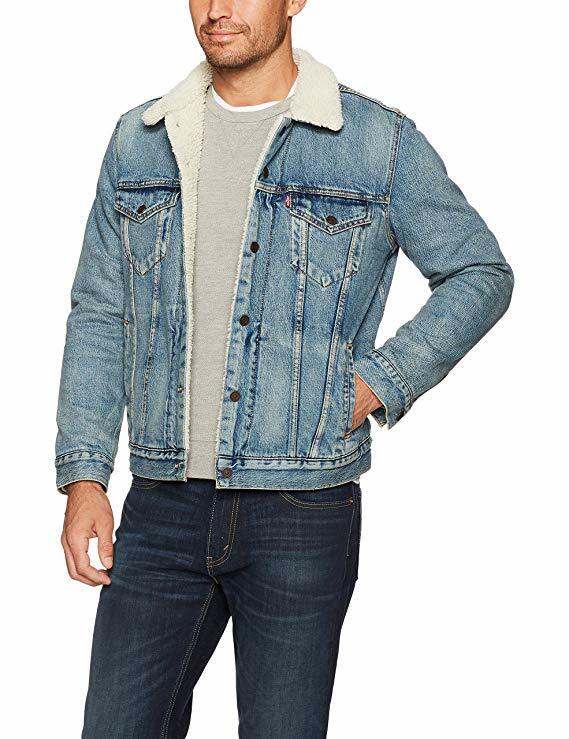 Super warm, stylish, awesome are some of the adjectives that have been used to describe this faux Sherpa denim jacket and it’s all for good reason. First, what makes a jacket Sherpa? The Sherpa jacket that are common all over the place was christened after a term – Sherpa lining – commonly used in the fabric industry. Sherpa lining refers to a lining made entirely of polyester. It comes with a deep pile and has a large and fuzzy texture that makes it look bumpy. The texture is kinda similar to sheep wool but that is where the similarity ends. Whereas sheep wool is bulky, heavy and takes longer to dry, Sherpa lining is the complete opposite. It is less bulky, lightweight, and dries faster. Sherpa lining is also much cheaper and certainly involves no animal in its production. Yup, in case you don’t know it, there are no animals named Sherpa. If you are vegan, this sounds like good news huh? On the flip side, if you don’t care about the ethics involved in using animal products, you can also get a sheep wool lined denim jacket. 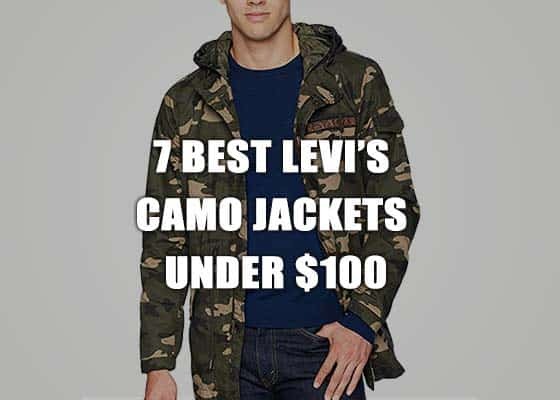 These wool lined jeans jackets are, however, considered luxury items and you have to shell out a bit more for them. But that should not be a bummer because they are durable, long lasting and worth every penny.